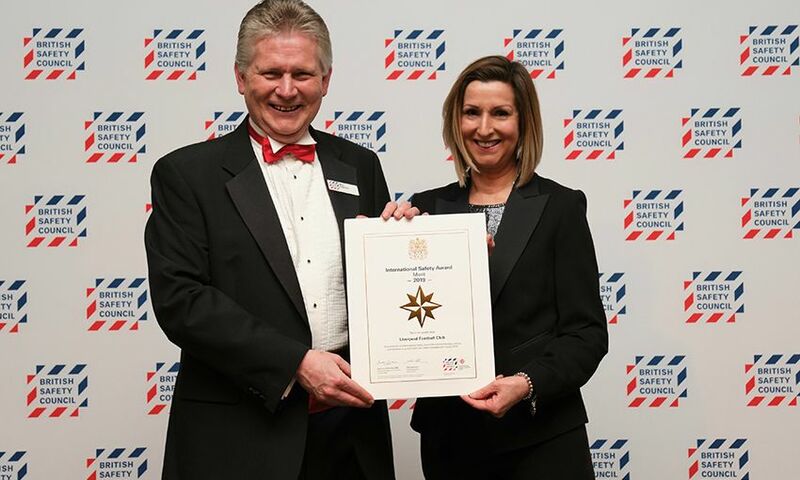 Liverpool FC was named as a merit winner at the British Safety Council International Safety Awards 2019. The annual gala dinner, held at the Grosvenor House Hotel in London, saw the club recognised for its exemplary management of health, safety and wellbeing during the 2018 calendar year. LFC's vision for health, safety and wellbeing is to achieve 'safety excellence' and the club is leading the way in the football, sports and stadium industry thanks to a number of implementations over the past three years. Gillian Wood, senior health and safety manager at Liverpool, said: “We are delighted to have been recognised for our commitment to health, safety and wellbeing. “It is testament to the hard work put in by the health and safety team and wider club employees in creating the positive safety culture we’ve established across all sites and departments. “This has been enhanced by the recent introduction of a bespoke online management system, which not only enables colleagues to manage their own health and safety risks more effectively but encourages a uniform approach to health and safety management across the business. Now in their 61st year, the International Safety Awards recognise organisations from around the world who have demonstrated their commitment to occupational health, safety and wellbeing. Applications are open to businesses of all types, sizes and sectors in both the UK and internationally, with winners selected by a team of independent chartered health and safety professionals. Liverpool FC is 126 today!